The trio performed their bilingual song "I Like It"
The American Music Awards were held in Los Angeles Tuesday, October 9th. 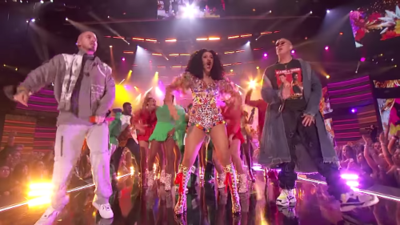 Cardi B along with Bad Bunny and J Balvin performed her show stopper song "I Like It" that featured live instruments such as bongos in the Latin trap-salsa track. The performance started with Cardi B on a spinning colorful platform with a camera overhead. Then she jumps off wearing a super colorful dress. Then the camera pans over to Bad Bunny who arrives on stages in a gold shopping cart delivering his verse wearing a third eye in the middle of his forehead. After BB's verse, J Balvin makes his debut from the top of a gold tree house type of structure that was part of the set. Then they all walk in formation together to conclude their stunning performance. Ozuna had posted a comment on Cardi B's YouTube account saying "Like si eres Latino 100%", which translates to "Like if you're 100% Latino." Cardi B was nominated for eight categories tieing with Drake. B won the "Favorite Artist - Rap/Hip-Hop" category at the annual awards show beating out Drake and Post Malone. In addition, she had also won "Favorite Song - Rap/Hip-Hop with "Bodak Yellow (Money Moves) .